At Novotel Bangkok Ploenchit Sukhumvit, everything is convenience for modern travellers to Bangkok. Because this four-star Bangkok hotel is affordable, cosy and convenient. 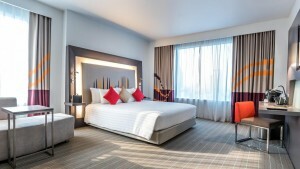 This wonderful hotel also located in the heart of the city and near BTS SkyTrain – Ploenchit station. Also Novotel Bangkok Ploenchit Sukhumvit lets you travel around town with ease. From here, you’ll be able to explore different sides of Bangkok you’ve yet to discover. Stylish décor, contemporary comfort and warm Thai hospitality — The Novotel Bangkok Ploenchit Sukhumvit lobby is designed as a proper social space. Once you arrive at the reception, you’ll realise how swift and simple a check-in is when everything is done. With floor-to-ceiling glass windows, the area invites plenty of warm sunlight. A little added bonus would definitely be the comfortable working desks and charging outlets, allowing guests to achieve the perfect work-life balance when they stay at our Bangkok hotel. Not only are we located by BTS SkyTrain Ploenchit Station, but we also offer easy access to major roads and expressways. 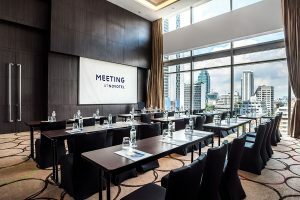 This makes Novotel Bangkok Ploenchit Sukhumvit the ideal Bangkok hotel for both business and leisure travellers in Bangkok. We can connect you to the city’s hottest restaurants, boutique stores and giant megamalls. This includes Siam Paragon, Siam Square, Central Embassy, CentralWorld, Terminal 21, Emporium and The Emquartier. This list goes on! With the convenience of the central location, you’ll also get to travel to the local and cultural districts of Old Town Bangkok, Charoenkrung Road and the quaint Chao Phraya River without being stuck in traffic. After a long day of work or play, you can retreat to the comforts of your Novotel guestroom or suite. With the convenient address of Sukhumvit, you’ll be able to return to your Bangkok hotel in no time. Also each of our 370 contemporary guestrooms and suites is designed to be lived in. With complimentary Wi-Fi connections, a large flat-screen TV with cable, unique bedding, we make sure every little detail is right. Whether you’re staying alone, with a partner or with your family and friends, you can count on us to deliver a pleasant stay. Treat your spacious room as your special world and make yourself at home. Let it be a nourishing breakfast, a family gathering or a romantic candlelit dinner for two, you can count on Novotel Bangkok Ploenchit Sukhumvit to deliver the most unforgettable dining experience. At our all-day dining restaurant, The SQUARE Restaurant, you’ll get to enjoy gourmet food from around the globe and around the clock too. When the sun sinks behind the Bangkok skyline, you’ll want to feast your eyes at our latest establishment Sky Lounge. With spectacular city views and a wide selection of craft cocktails, the rooftop lounge is the ideal place to hang out or celebrate a special occasion. For after-work drinks and live entertainment, you’ll want to visit Dee Lounge and Beer Garden. 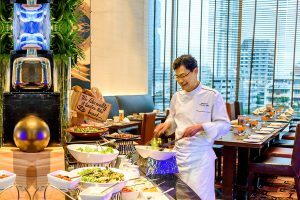 To cater to your personal tastes and preferences, there numerous dining options for you to choose from at our Bangkok hotel. At our Bangkok hotel, you can always stay in shape at our InBalance Fitness centre. Here, you can keep up with your daily workout routine. With the latest cardio, strength training and stretching equipment, you can sculpt your body and focus on particular areas if you’d like. We’ve also got professional personal trainers on-site to help you out or give you a little push. Alternatively, you can also take a dip in our outdoor swimming pool. To relax and recharge your batteries, enjoy a steam in one of our sauna rooms. 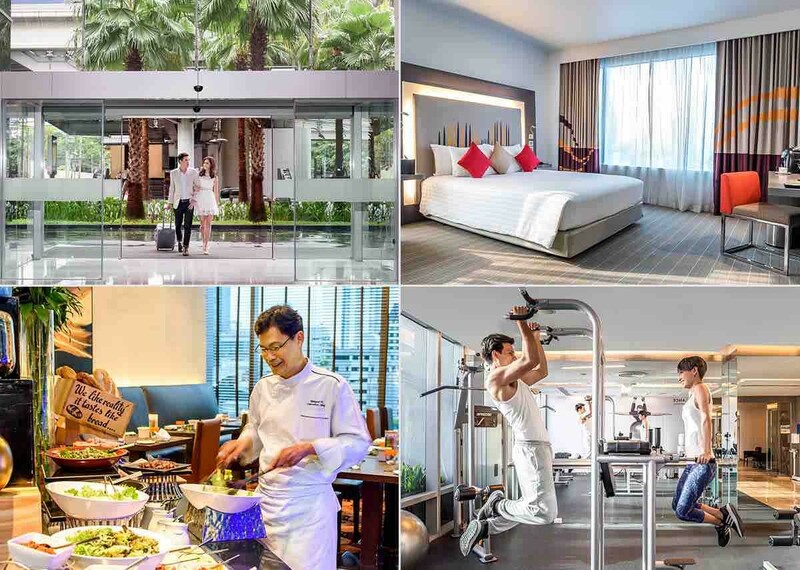 Novotel Bangkok Ploenchit Sukhumvit is always excited to invite our guests to experience something unique in our home city. There is no better place to stay on your own or with my family, for business or for leisure. Whatever you might need help with — booking reservations, local tips, transportation help or travel planning — you can simply give us a call or contact us directly at the front desk in the lobby. We will do our best to accommodate your needs and desires when you stay with us at our Bangkok hotel. The choice is yours at Novotel Bangkok Ploenchit Sukhumvit. Let us give you the warmest welcome and the most comfortable stays at our four-star property.